mind, Martin Luther King and other like-minded individuals (e.g. 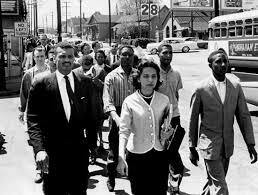 the Freedom Riders) participated in a series of nonviolent marches, sit ins, and protests against the injustice practiced in the south, and history records that the legacy of this movement changed the social structure of southern society and finally ended segregation’s hold in the south. This template of nonviolent resistance is powerful, but I would also like to add that there is more that we need to add to it to affect the changes we need in this hour. For now let’s concentrate on King’s letter, but before we contrast this letter with the Ferguson riots, it would be well to discuss Martin Luther King’s strategy to end injustice contained in his letter. Over the past few years I have consistently preached that nonviolence demands that the means we use must be as pure as the ends we seek. I have tried to make clear that it is wrong to use immoral means to attain moral ends. Martin Luther King also employed civil disobedience as a strategy to end injustice, but he was careful to define what he meant lest others think he advocated anarchy. King wrote that there are just laws and unjust laws on the books. We can distinguish which is which by their agreement with the word of God. King writes that “A just law is a man made code that squares with the moral law or the law of God.” In other words, just laws advance good government as well as the happiness and safety of society; therefore it is necessary to obey just laws. On the other hand, King defines an unjust law as “a human law that is not rooted in eternal law and natural law…Any law that degrades human personality is unjust.” Segregation laws are unjust because the concept of segregation “distorts the soul and damages the personality. It gives the segregator a false sense of superiority and the segregated a false sense of inferiority.” King mentions the case of Shadrach, Meshach, and Abednego as an example of civil disobedience. They refused to obey the command to bow down to the image King Nebuchnezzar set up because it violated the commandments of God. 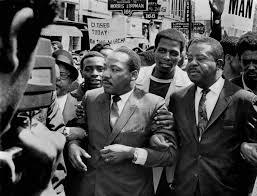 King wrote that any campaign of nonviolent protest must include these four steps: “Collection of facts to determine whether injustices exist; negotiation; self purification; and direct action.” Let’s address these one at a time. The question of whether or not an actual injustice occurred must be definitively answered before action is taken. This seems like an obvious precaution, but history has many examples in which action proceeded on the basis of impulse and sketchy facts rather than irrefutable evidence. Strong and passionate feelings that an injustice has occurred are never sufficient cause for action to proceed. When this evidence has been obtained, then the next step is to negotiate. The evidence of injustice is now the basis for negotiation between the parties for redress of grievances. If the negotiations resolve the injustices, then there is no need to proceed further. But if negotiations fail, then the next step will be self purification. King realized that his opponents would be out in force to resist their efforts, but they cannot meet the opposition on his own low ground if they want to prevail. Pure means must be used to gain pure ends, so the participants must be properly trained to stay true to the principles of nonviolence. They cannot fight back if they are beaten, and they must be prepared for arrest and jail for their activities. They are now ready for the last step. Left by itself, negotiation will never happen unless circumstances prod it into action. According to King, the purpose of nonviolent direct action “is to create a situation so crisis packed that it will inevitably open the door to negotiation.” Direct action creates the necessary tension that drives the parties back to the negotiating table so that the injustices may finally be resolved. There is one more point I would like to address from King’s letter, which was his disappointment with the church. The church is God’s visible representation on Earth. The members of the church are God’s ambassadors, and as believers the church is to continue doing the same works that Yeshua (the Hebrew name for Jesus) did. If this is true, then where are the works? Why is society tearing itself apart when the church has the words of life? Why isn’t our nation getting the balm it needs to heal its wounds? Martin Luther King had high hopes that the church would work with him against injustice in his day, but that hope was to end in disappointment. We have seen many of these disgusted young people in the Ferguson riots and in the satellite protests in other cities. We need our church leaders to stand up as never before and speak “thus says the Lord” in power and demonstration of the spirit, but many are silent instead; they prefer to take a path that doesn’t offend anyone and friendship with the world. The consequence of this is a self-destructing society and a church that has become an enemy of God. The cold and worldly church of Martin Luther King’s day has become even more so today. This spiritual decay will also be mentioned as a contributing factor when future historians write about the decline and fall of our republic. Now that we have taken a look at Martin Luther King’s “Letter from Birmingham Jail,” let’s evaluate the events of the Ferguson riots and subsequent Eric Garner protests (hereafter referred to as Ferguson et al) using King’s letter as our guide. Martin Luther King advocated a campaign of nonviolence because only pure methods can achieve pure results. If King had gone to Ferguson, he would certainly not be a part of the violence that is still ongoing. If he were to participate, it would be to lead peaceful, nonviolent protests that don’t result in offense and destruction. The destroyed businesses of Ferguson would still be standing if the protesters had chosen to follow King’s path of nonviolence, and the citizens would all benefit from this respect for life and property. There can be no doubt that civil disobedience is happening in Ferguson et al, but it certainly isn’t the civil disobedience Martin Luther King advocated. The situation in these cities is really bordering on chaos and anarchy; respect for the rule of law is at an all-time low, and there is a complete disregard for obeying just laws. Martin Luther King’s civil disobedience preserved the rule of just laws, which is something that ought to never be neglected. Nothing good will ever come when just laws are disobeyed. The situation in Ferguson et al and the attitude of some of the people show how little regard there is for the rule of law and due process. When Sean Hannity recently interviewed Rep. Eleanor Holmes Norton, she wasn’t concerned about the evidence. She unbelievably said that it doesn’t matter what did happen, but what should have happened. This is especially shocking since she is a lawmaker; what’s the point in having laws if we disregard them whenever we don’t like them? In that case we could disband our legislatures and do whatever we want. Respect for the law enforcement is also under assault because Michael Brown’s death is touted as racially motivated. They have come to see the police and law enforcement as defenders of the corrupt status quo, and so they are reviled and disrespected. This appalling behavior was recorded in Denver when protesters openly mocked a police officer, who was protecting them, was hit by a car. We cannot say we have become better as a nation when the suffering of another human being is mocked like this. The evidence collected by the grand jury in its decision about Michael Brown’s death has been released for public scrutiny, but that made no difference to Ferguson et al. It was totally ignored in favor of the supposition that a white police officer killed an unarmed black teenager, ergo it was a racially motivated homicide and the grand jury is just letting Officer Darren Wilson off the hook. It was a perfect reflection of Rep. Eleanor Holmes Norton’s thinking in this matter. Facts were important to Martin Luther King, and ought to be to everyone. Without the evidence of injustice, there could be no justification for protest or civil disobedience. When facts are thrown under the bus, we begin the shift from a nation of laws to a vigilante nation where emotional fervor supplants rational thinking, evidence, and the rule of law. We are well on our way to making Walter Van Tilburg Clark’s “The Ox-bow Incident” a reality. Negotiation and self purification were non factors in Ferguson et al. There was no dialogue or negotiation in Ferguson et al, just flames of discontent fanned white hot by the racial stokers of our day, nor was there any serious consideration of using the strategy of nonviolent protest. King advocated. The violence and lawlessness in Ferguson et al rolled downhill like a boulder destroying everything in front of it. 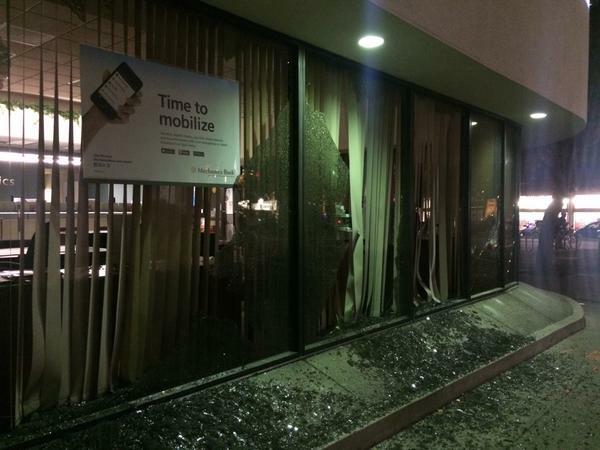 Glass shards from broken windows littered the streets like an American remake of Kristallnacht. Crowds blocked highways and refused to even allow emergency vehicles to pass through. Zemir Begic, an innocent Bosnian man, was bludgeoned to death by black teenagers during the “protests.” Five days later a Bosnian woman was dragged from her car, threatened with murder, and beaten. Businesses (including the one Michael Brown robbed) that had no connection whatsoever to the grand jury verdict were targeted for vandalism, looting, and arson. 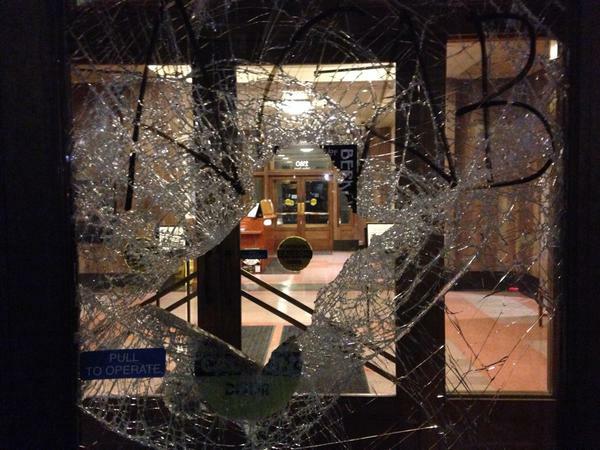 As if to spite King’s strategy of nonviolence, rioters even vandalized the Martin Luther King building in Berkeley CA. All this violent direct action achieved was to create offense in hearts of many people and decimate the neighborhood. Sowing violence will reap a harvest of violence if the process is not stopped. There are better ways to handle injustice than violence. Even if all the people of Ferguson et al did was to consider the “Letter from Birmingham Jail” and glean its wisdom and advice to advance their cause, the riots of Ferguson et al would never have happened because the facts would not support direct action. And even if direct action were appropriate, it would have been nonviolent in nature. Some of you may have heard there was a decision that came out today by a grand jury not to indict police officers who had interacted with an individual with Eric Garner in New York City, all of which was caught on videotape and speaks to the larger issues that we’ve been talking about now for the last week, the last month, the last year, and, sadly, for decades, and that is the concern on the part of too many minority communities that law enforcement is not working with them and dealing with them in a fair way. What? This has been going on for decades? He makes it sound like the problem is widespread and vast, but I take exception to his statement. Our law enforcement community has been unfairly portrayed by the President’s words. While it is true that there have been instances of bad apples in police departments across the nation, it does not follow that this is indicative of a widespread problem. With this in mind, I would like to offer up my contribution to the reconciliation of law enforcement and our community with an open letter to all of those serving in law enforcement. President Obama (4 Dec 2014) has made remarks recently that paint a picture of law enforcement officers in a negative light. I want you to know I strongly disagree with the allegation made in his statement that you have not treated all the members of our community fairly. This blanket statement lumps all of law enforcement into one basket, and to use the President’s own words, this doesn’t treat everyone fairly. It has to be admitted that sometime there are bad apples in the police department, and it is unfortunate when the press focuses attention on them, or when politicians blame our problems on law enforcement officers for the sake of politics. For every bad apple, there are scores of officers who are serving with honor and distinction. These are the officers I want to recognize and thank; they don’t always get the credit they deserve, but their work and sacrifice are what help make our community a better place. They are well trained professionals we depend on when things get out of hand. I want to thank all of you for your service to our community. You do a thankless and dangerous job, and you do it with honor and professionalism. I gratefully acknowledge a debt of gratitude that I owe you for your service. I pray that the Lord will send His angels to watch over you when you report to work, and bring you home safely to your families at the end of your shift. I would encourage everyone to also extend their thanks to our law enforcement officers for the work they do. Thank you again for your service and a job well done. Reconciliation means we also need to actively forgive each other. Unforgiveness only advances the Adversary’s kingdom, and we don’t want to be on his team, do we? We are also in a shemitah year, which is a year of release. At the end of the shemitah year all debts were to be cancelled. Let’s make the shemitah year real again and cancel all debts whether they are physical debts or spiritual ones. Forgive freely because you have been forgiven. Set your debtors free because the Lord has set you free. The only debt that is allowed to survive the shemitah year is the debt we have to love one another (Rom 13: 8). Love is the glue that will bring us together and heal our wounds. Therefore love the Lord your God with all your heart and soul and mind and strength, and love your neighbor as yourself. Therefore, confess your sins to one another and pray for one another, that you may be healed. The prayer of a righteous person has great power as it is working. Elijah was a man with a nature like ours, and he prayed fervently that it might not rain, and for three years and six months it did not rain on the earth. Then he prayed again, and heaven gave rain, and the earth bore its fruit. Fare ye well, my beloved.